A series of deflection ribs to protect the upper sidewall area. Objects are deflected away to protect penetration into the sidewall. Three-ply construction on all sizes provides race-proved durability and puncture resistance. Robust compound gives excellent cut and chip resistance. Ultra high-strength steel belts ensures even footprint for confident stability. Bumpers help release stones and debris from the large deep grooves, protects the groove bottom and minimizes stone drilling. Added gauge improves puncture resistance. 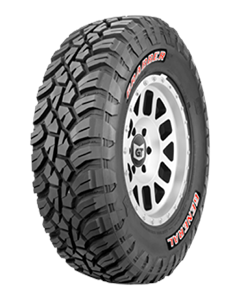 Aggressive, open pattern for high traction in mud, dirt, sand and gravel. Evacuation channels all for quick and efficient self-cleaning action. Each individual pitch length helps to minimize tread generated noise on the street. Remarkably quiet and comfortable for the street and aggressively talented for off-road terrain. The open pattern increases traction with many gripping surfaces and edges, arranged at multiple angles for grip in every direction. Optimized placement of the sipes to provide impressive wet street and snow performance. Sipes are full depth to maintain grip throughout the tire's life. Depressed blocks alternating on the shoulders to deliver additional grip on complex surfaces. This provides all surface traction. Aggressive upper sidewall designed to protect from stones, sticks and other debris. Additional traction is achieved in challenging conditions from the innovative alternating patterns.